What makes Safe Spectrum lamps different? Light is color. Light is defined as the part of the electromagnetic spectrum that is visible to the human eye. The visible portion of the spectrum covers a wave-length range from approximately 380 nm to 780 nm. 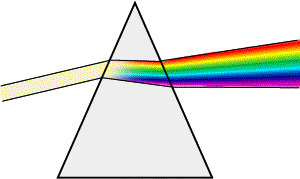 The human eye regards the green/yellow portion as brighter and the outer blue/red portion of the spectrum as darker. General purpose lamps are designed to focus in the green/yellow portion of the spectrum to provide brightness when lighting offices, schools, warehouses, etc. Promolux lamps are designed to encompass a full portion of the spectrum. Including the darker colors will give a slight impression of less brightness, but it will dramatically increase the vividness of colors that exist in the merchandise placed beneath the lamps. Many of the present methods of measuring the quality of a light source in terms of its color rendering are outdated, misleading and inadequate for today's technology. i Despite this understanding among all lighting technology experts, the light suppliers continue to define the quality of a light source by the "Color Rendering Index" (CRI) and its "Kelvin Correlated Color Temperature" (CCT). Methods which use criteria such as "Color Preference Index" (CPI), "Color Definition Index" (CDI), "Color Saturation", "Color Gamut" and other parameters such as UV and Infrared content are becoming widely used by leading lighting scientists. ii These methods which will soon define quality lighting, use sophisticated software and computers that measure light based on the human eye perception of color. As it is already documented in numerous publications, so we will only point out a few of the problems related to CCT and CRI. The Kelvin CCT was designed to compare the chromacity of incandescent lamps. It is still valid for that use, but it is quite inadequate to compare fluorescent tubes of different "Spectral Power Distribution" (SPD). For example, it is possible to have two very different fluorescent lamps in color such as green and pink, yet both having the same CCT. An incandescent lamp by definition has a CRI of nearly 100. This however does not mean that the incandescent bulb has an ideal color rendering. It can easily be seen that an incandescent bulb distorts all colors with an excessive yellow glow with too little blue content. It is also defined that outdoor daylight has a CRI of 100. However, we all know that a north sky light distorts colors due to its high blue and very low red content. Furthermore, all daylight is not the same and its chromacity changes depending on the region, various seasons or even the hours of the day. Yet by "definition" they are all natural daylight with a CRI of 100. The CRI was designed to compare lighting sources of similar and continuos SPD with the same chromacity. These factors must be considered when making lamp comparisons, otherwise visual distortions result such as lamps with a lower CRI showing a much better color rendering while another lamp with a higher CRI will provide poor color rendering.